Here at Llandrillo Library we are always trying to keep up to date with new teaching technologies and resources to support our learners and tutors. Some of the librarians are tutors too, so we are always updating our own pedagogies and skills. As part of this we are taking part in the Blended Learning Essentials MOOC with Future Learn and the University of Leeds. For this we also need to create a learning journal and we’ll host it here – to share ideas, content and future plans we’ll have as we work through the course. This will be especially relevant to the online delivery guidelines that will be implemented in FE from next year in Wales and the digital practitioners building their skills in the college now. You’ll also learn a lot more about what we can support you with in the library and see how we can best work together to support the college aim of inspiring success by proving excellent education and training. Reflecting on what it means for us, our teaching and the support we provide. This was a great blog post by JISC that was shared in week 1 talking about why it’s so important for teaching staff to go digital. But the discussion forums also stressed that there is no point in just talking about digital resources in a classroom – you must use them, embed them and collaborate with learners to make the most of the learning experience. The discussion also related very much to other work we are doing in the library to support the HEA Distinctive Graduate stream with our Digital Footprint for employability seminars and workshops. Going digital supports learners to develop transferable skills that employers need, as well as engage more with their course work and stay motivated. It also links in well with the teaching practice that already exists in the Library FDa programme which is delivered online and via video conference. We talked about how we use social media and online resources to support sharing info, current awareness, reflective practice, group work. It also means there is flexible access to content and also out of hours contact with tutors. We used Typeform to give suggestions on blending learning activities and thought of practical examples – like asking learners to choose audio visual resources to support the class. This helped me to reflect on the value of using blended learning in a classroom to help with embedding concepts, increased preparedness and progression. The section on social learning was a point that really stood out – independent study is hard work! You need support and interaction to help and blended learning provides that. This week was all about reflecting on the value of blended learning for tutors and learners. One thing I felt that wasn’t mentioned was the benefit to learners of peer support and creating a motivating learning community. This type of peer support increases learners confidence and encourages people to contribute to their best ability – not just providing something that’s ‘good enough’. This entry was posted on November 5, 2015 at 12:23 pm	and is filed under academic libraries, Digital Literacy. 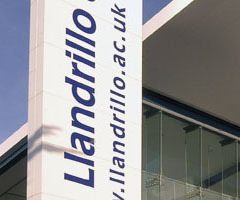 Tagged: Blended_Learning, coleg llandrillo, Elearning FELTAG, grwp coleg menai. You can follow any responses to this entry through the RSS 2.0 feed. You can leave a response, or trackback from your own site.